The new Transit additions include at least five more cities in Virginia, while Missouri incorporates bus lines in Springfield and St. Louis. Apple has yet to update its iOS Feature Availability website to reflect the changes. Maps Transit directions are now live across Virginia, with data provided by GRTC in Richmond, Charlottesville Area Transit, Harrisonburg Transit and HRT Bus in Hampton, Newport News and Norfolk. Information for HRT Light Rail's The Tide line in Norfolk is also available. 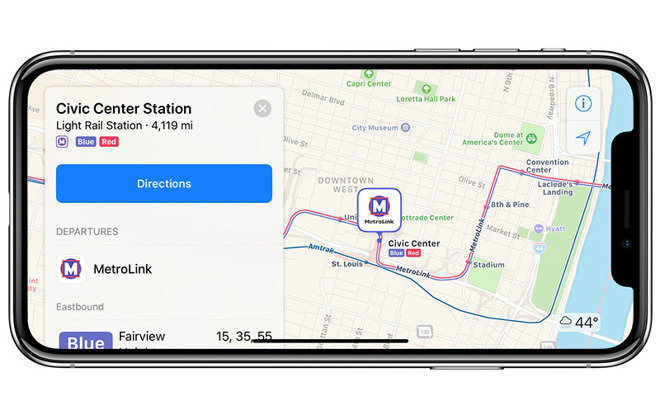 Apple expands on existing support in Missouri with data from City Utilities Transit in Springfield, while St. Louis now includes routes for MetroLink and MetroBus lines. The company first flipped the switch on transit directions in the state with integrations for Kansas City in 2016. As usual, area users now have access to bus and train arrival and departure times, route creation tools and service advisories, all of which are powered by data from local providers. Apple Maps Transit provides features common to major mapping services, including routes, departure times and other relevant data for buses, trains, ferries and other forms of public transportation. To stand out from the crowd, Apple integrates top-down schematic views of select underground subway and train stations, complete with clearly marked entrances and exits for quick on-foot navigation. Apple removed public transportation navigation when it deprecated built-in Google Maps support from iOS, but later reintroduced the feature with iOS 9 in 2015. The updated Transit function was created in-house with the help of technology obtained through acquisitions like HopStop and Embark. Transit debuted with a limited rollout in the U.S. and China, which was followed by coverage in the UK and Japan in 2016. More recently, the service appeared in Paris, Singapore, the Netherlands and Adelaide, Australia last year. Apple has aggressively added more locations in the U.S. over the past few weeks, rolling out compatibility Arkansas, New Mexico, in Orlando, Fla. and West Virginia just this month.